The Victoria Pineapple, which has been on sale in my local supermarket for the last couple of weeks, is a real gem. 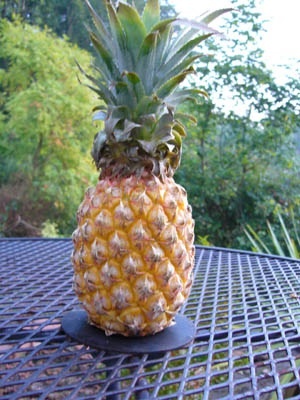 Although about a quarter of the size of the usual pineapple, it is much more intensely flavoured. They are imported from the Ivory Coast and reminded a friend of the pineapples she used to eat there, around Abidjan, in their small size, spiky leaves and taste. All pineapples on sale, she said, were small. The best were white fleshed, so soft you barely noticed any fibres and sweet with hardly any acidity; you could eat them almost for ever and suffer no ill effects! It all sounded blissful with a drive to the beach taking you past roadside sellers with huge basins full of small pineapples. Perhaps we have a reader from pineapple growing lands – Florida, Hawaii, or even Ivory Coast – who can tell us more about the flavoursome Victoria? I read your article about the Japanese wineberry with interest. I emigrated from Holland to Canada in 1953. I was then 19 years old and remember our garden in Holland quite well, which had a couple of apple, pear and plum trees, a souer cherry trained to the side of the house and the Japanese wineberry. It made a delicious dessert. 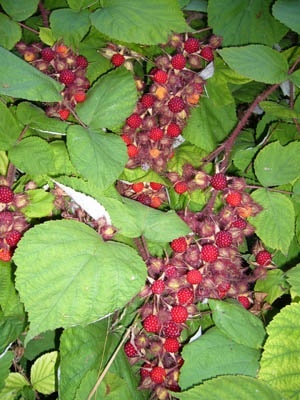 Do you think it might be possible for someone to send me some seeds of the wineberry? You say it is easily propagated by seed. Are Pink-Fleshed Apples Good for You? Discovery apples have finally ripened – in early September – about a month late according to many people’s idea of when it should be ready to eat. Not only are they delicious but also the skin colouring in many of them is intense, the flesh also more intensively coloured than normally seen. The skin of an apple contains nearly all of the beneficial substances, known as antioxidants, which neutralise the free oxygen radicals formed all the time in the body by radiation from the heavens. One of these antioxidants, called a flavonoid, is deep red. 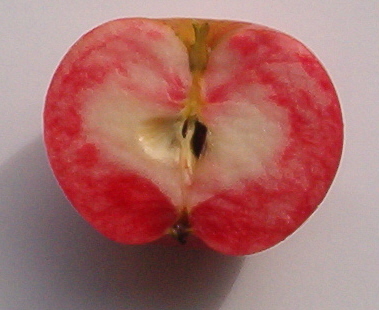 It is therefore clear that the deeper the red colouration, at least in the skin, the healthier will the apple be. Does this also apply to colouration of the flesh? It is a shame that Discovery is slowly disappearing from the market, mainly due to the fact that the public’s love of Gala and Braeburn have eclipsed the need for early ripening English apples. These two varieties are freely available at that time from New Zealand, where they originated. Discovery’s demise was possibly also helped by the fact that, because of the previous rush to get the first Discovery apples onto the market, they tended to be sold with only a faint red flush, and in my opinion were not very sweet.